Switches grid snapping on and off. Turns grid rendering on and off. Adjusts the grid density. Finer Grid increases and Coarser Grid decreases the grid density. Opens the Goto Brush/Entity dialog. Brushes: Number of brushes in this map. Faces: Number of faces in this map. Point entities: Number of point entities in this map. Brush (solid) entities: Number of entities related to a brush. Unique texture count: Number of different textures. 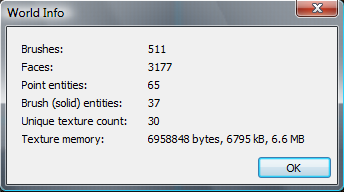 Texture memory: Amount of memory used by the maps textures. Opens the Entity Report dialog. 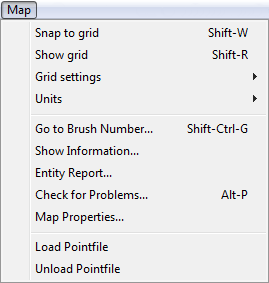 Checks for problems in the map architecture and opens the Map Error Report dialog if problems were found. Selects the world object (and therefore recursively all map objects) and opens the Inspector dialog to show the properties of the map world entity. Loads a pointfile into the map (see Dealing with Leaks for more details). Removes a previously loaded pointfile.